A study report by U.N. education agency says cell phones are getting more and more people to read in developing countries, where books are rare and illiteracy is high. The report published on 23 April, on the occasion of World Book and Copyright Day by UNESCO’s study of mobile reading was conducted in seven developing countries, Ethiopia, Ghana, India, Nigeria, Pakistan, Uganda and Zimbabwe. 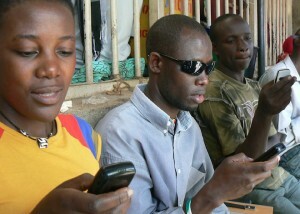 It highlights that hundreds of thousands of people currently use mobile technology as a portal to text. The first-ever study of mobile readers in developing countries report, provides valuable information about how mobile reading is practiced today and by whom. 774 million people worldwide, including 123 million youth, cannot read or write and illiteracy can often be traced to the lack of books. Most people in Sub-Saharan Africa do not own a single book, and schools in this region rarely provide textbooks to learners. The report cites data showing that where books are scarce, mobile technology is increasingly common, even in areas of extreme poverty. The International Telecommunication Union estimates that of the 7 billion people on Earth, 6 billion have access to a working mobile phone. Many neo- and semi-literate people use their mobile phones to search for text that is appropriate to their reading ability. Next articleHow close is Amazon’s smartphone?